Silver and Brut both came from litters where there wasn't a lot of human handling. Both are very loving dogs, but neither are much for cuddling or showing grave amounts of affection. 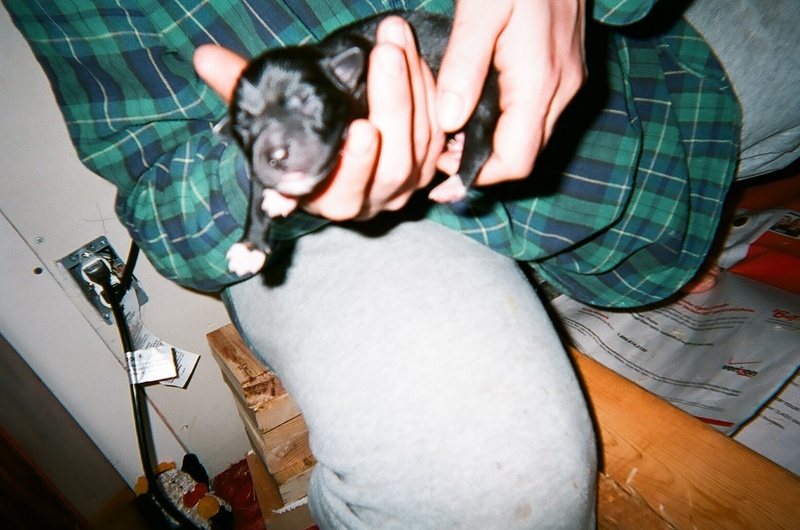 We were handling the puppies from the minute they were born. Mostly out of necessity, but let's face it we couldn't keep our hands off of them! :) One of my goals in raising the puppies was for as much handling as possible, as I wanted to bypass what had happened to Brut as a young pup. 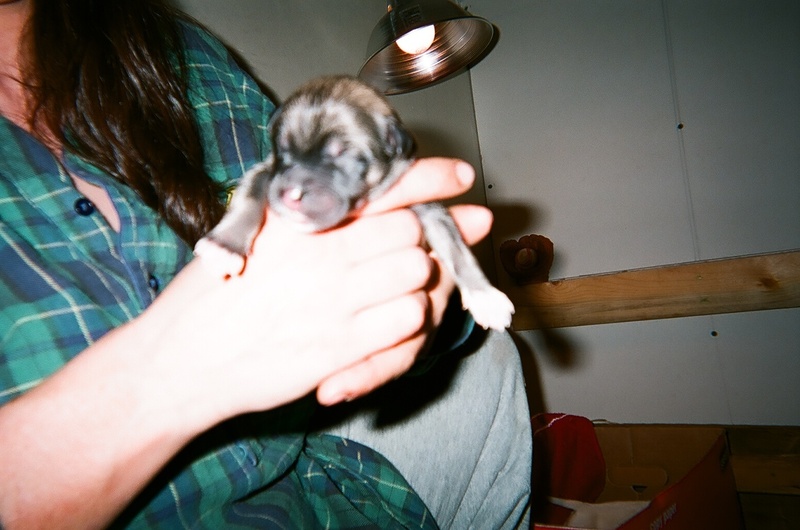 I wanted the pups to be born and be with their mother until they were at least nine weeks old and I wanted them to grow up having the social skills that they receive from living with their siblings. Two things that were taken away from Brut in his early puppy days. Not that that was very difficult to do! We were also keeping our hands all over those puppies and we were constantly rewarded with sweet, loving puppies. Yes, they could be little terrors sometimes, get ten puppies in one room and it is bound to happen, but they were equally loved and emotionally well balanced. It was such a blessing. When we visited some of the puppies from our litter, we are still rewarded with this love. Both my husband and I are almost knocked down with the kisses from "our" pups. They still remember us and are never afraid to share their love for us. I don't know how many times I've heard the owners say that we are the only ones that their dog will greet like that. What an impact we were able to make on their lives, but it no where near the impact they made on ours. What a wonderful feeling to be loved. This is so lovely. I would not managed to keep my hands of them either. You gave them a wonderful start in life and they show love back to you. What a wonderful story! I wish that everyone realized that you get more socialized, balanced pups when there is a lot of human and canine interaction from Day 1. What a great thing to read this morning! They were all lucky to have such wonderful people taking care of them! What a great start of the pups. 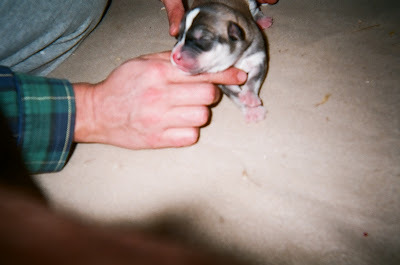 From many years ago I remember the puppies opening their eyes after weeks of being lovingly handled and just smiling at us. It's a nice side benefit that puppies need to be handled as much as we enjoy handling them! Thank you so much for these adorable photos on a gloomy, depressing day. I feel a lot better now. :-) Nothing like some puppy love. Animals are experts at making a person feel very special. And good on you guys for being so responsible and caring with the puppies! Thank you for the advice on Aschiuta's "madness". We found her alone on the street at about 1 month old. Maybe she could have used more sibling bonding, like your litter of pups. They are absolutely adorable and it's nice that they still remember you after being with another family and that they greet you with big doggie kisses. OmG! Just look itty bitty teeny tiny they are. They are too precious! What a wonderful approach to greeting newborns; what a fantastic first experience in life! You did SO right by them.